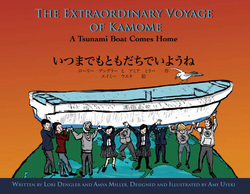 The Clarke Museum will host a free storytelling hour with local author Dr. Lori Dengler to celebrate the anniversary of the release of Dr. Dengler's children’s book The Extraordinary Voyage of Kamome: A Tsunami Boat Comes Home. It tells an exciting tale of two towns, thousands of miles apart, that were connected by the 2011 Tohoku Earthquake and Tsunami. The book is available in the Clarke gift shop and in our online store.